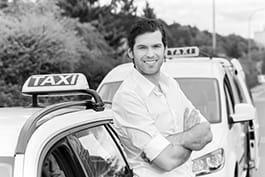 Taxi drivers drive a taxicab, van or limousine (company or privately owned) to take passengers and their luggage to the desired destination. Check the vehicle, e.g. lights, brakes and windscreen wipers, to ensure proper operation. Perform minor repairs and routine vehicle maintenance, e.g. clean the vehicle, and check tyre pressure, petrol, oil and water. Communicate with the base using radio, telephone or computer systems, e.g. to receive requests for passenger service and to report delays or vehicle problems. Pick up passengers, e.g. at prearranged locations, at taxi stands, or by cruising streets. Assist passengers entering and getting off the vehicle, and help in lifting luggage. Determine the best route to passenger's destination, e.g. by using local knowledge or navigation equipment. Drive the vehicle with care following safety, traffic, taxi operation, etc. regulations. Inform and advise passengers, e.g. of delays or unforeseen circumstances. Keep accurate records, e.g. of driver shifts, trip information (e.g. time and place of pick-up and drop-off), fares and expenses. Receive payments for fares and give change. Take adequate measures in case of accidents or emergencies, e.g. by notifying appropriate authorities, taking safety measures, etc. Know the geographic area in detail; know where different organisations carry out operations. Provide customers with accurate and up-to-date information about charges and price rates. Maintain vehicle appearance by washing, cleaning and performing minor adjustments and repairs. Have the ability to follow spoken instructions received from colleagues. Strive to understand and clarify what is being requested. Drive vehicles in urban areas. Interpret and understand transit signs in a city, the regulation of traffic, and the related common automobility agreements in an urban area. Handle petty cash for minor expenses and transactions required for the daily running of a business.